A multi-start thread consists of two or more intertwined threads running parallel to one another. Intertwining threads allow the lead distance of a thread to be increased without changing its pitch. A double start thread will have a lead distance double that of a single start thread of the same pitch, a triple start thread will have a lead distance three times longer than a single start thread of the same pitch, and so on. By maintaining a constant pitch, the depth of the thread, measured from crest to root, will also remain constant. 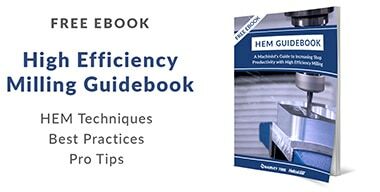 This allows multi-start threads to maintain a shallow thread depth relative to their longer lead distance. 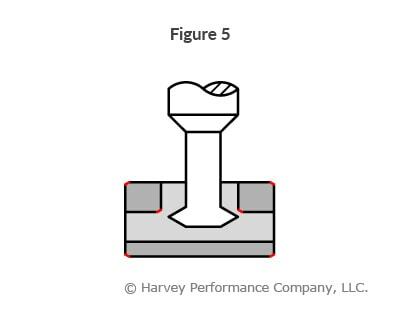 Another design advantage of a multi-start thread is that more contact surface is engaged in a single thread rotation. A common example is a cap on a plastic water bottle. The cap will screw on in one quick turn but because a multi start thread was used there are multiple threads fully engaged to securely hold the cap in place. Figure 1 displays a triple start thread with each thread represented in a different shade. The left side of the image represents a triple start thread with just one of the three threads completed. 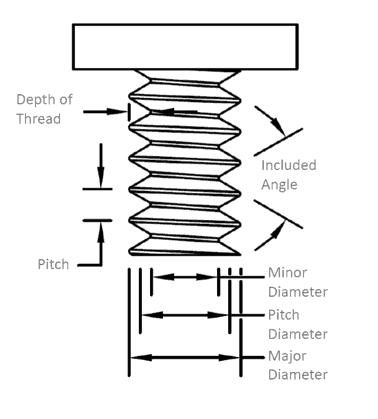 This unfinished view shows how each individual thread is milled at a specific lead distance before the part is indexed and the remaining threads are milled. The right side of the image displays the completed triple start thread with the front view showing how the start of each thread is evenly spaced. The starting points of a double start thread begin 180° apart and the starting points of a triple start thread begin 120° apart. Figure 2 displays the triangle that can be formed using the relationship between the lead distance and the circumference of a thread. It is this relationship that determines the lead angle of a thread. 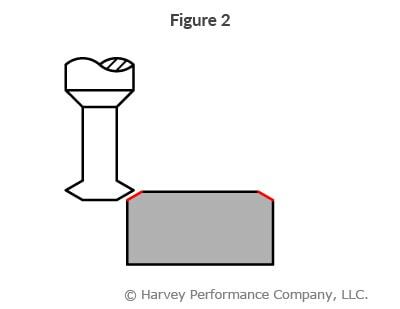 The lead angle is the helix angle of the thread based on the lead distance. 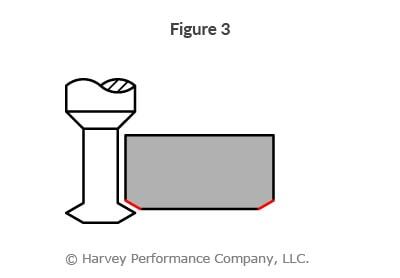 A single start thread has a lead distance equal to its pitch and in turn has a relatively small lead angle. Multi-start threads have a longer lead distance and therefore a larger lead angle. The graphic depicted on the right is a view of the lead triangle if it were to be unwound to better visualize this lead angle. The dashed lines represent the lead angle of a single start thread and double start thread of the same pitch and circumference for comparison. The colors represent each of the three intertwined threads of the triple start thread depicted in Figure 1. The charts below display the information for all common UN/Metric threads as well as the lead and lead angle for double and triple start versions of each thread. The lead angle represented in the chart is a function of a thread’s lead and major diameter as seen in the equation above. 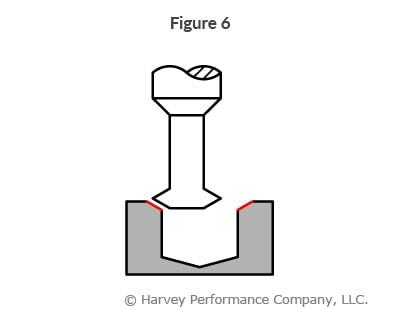 It is important to be aware of this lead angle when manufacturing a multi-start thread. 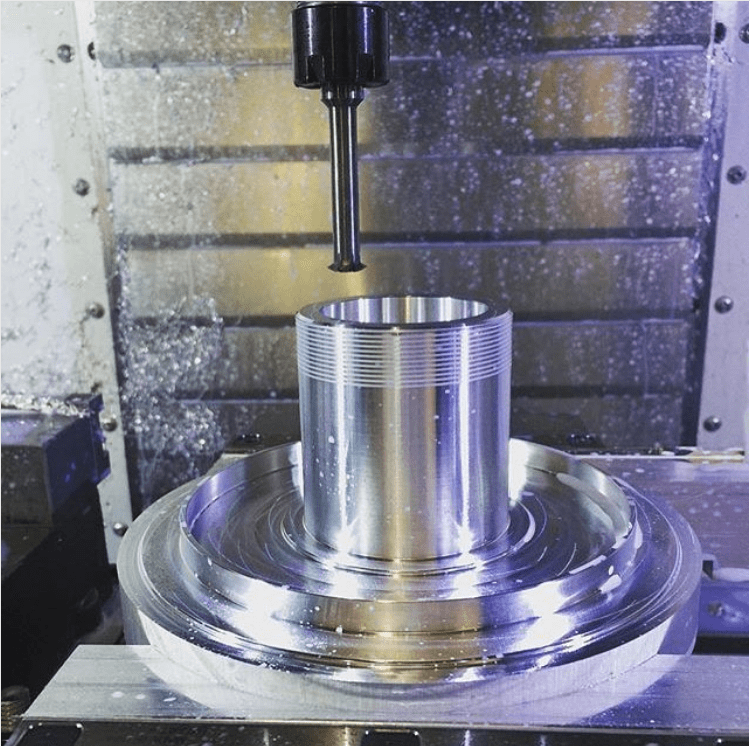 The cutting tool used to mill the thread must have a relief angle greater than the lead angle of the thread for clearance purposes. 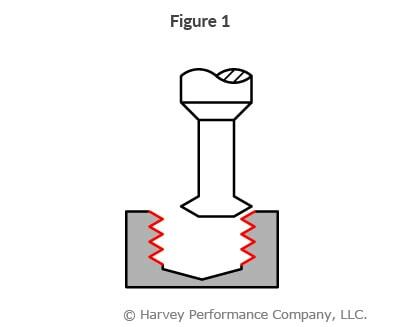 All Harvey Tool Single Form Thread Milling Cutters can mill a single, double, and triple start thread without interference. 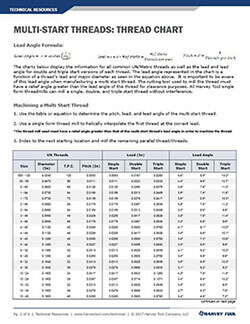 Use the table or equation to determine the pitch, lead, and lead angle of the multi-start thread. 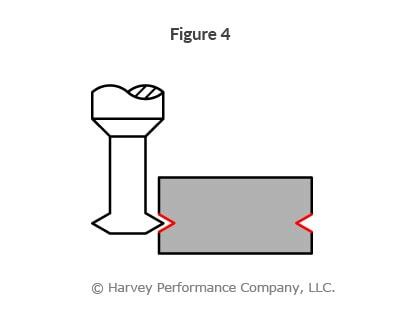 Use a single form thread mill to helically interpolate the first thread at the correct lead. *The thread mill used must have a relief angle greater than that of the multi-start thread’s lead angle in order to machine the thread. Index to the next starting location and mill the remaining parallel thread/threads. Click here for the full chart – starting on Page 2.